The Ranty Highwayman: Priorities - Who Is The Street For At Stoke Newington? Priorities - Who Is The Street For At Stoke Newington? Transport for London is currently consulting on its plans, apparently working with the London Borough of Hackney, to "transform Stoke Newington gyratory into a place for people." Except it won't be a place for people because the objectives are muddled and fudged. OK, it's easy for me to be an armchair pundit without the traffic data and an army of experts sitting behind me, but in fact that doesn't matter because no vision has been set for the scheme. I've no issue with the aims; at the moment, buses and cycling are routed around the gyratory and so for people travelling south, they travel on a diversion of nearly 1.2km where the direct route would be 500m. 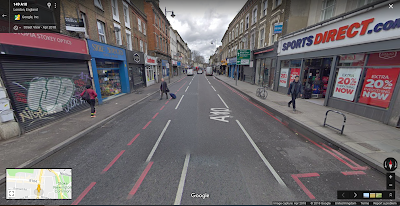 This means that if a person is cycling to the shops on Stoke Newington High Street, one of their legs will be round the long way (depending where they are coming from and probably even more complicated if they are coming from the residential areas either side. For bus passengers, those travel through the area have their southbound journey times increased because of the gyratory and many wanting to get to the shops will have to walk much further than if buses could take the direct route. You can read the proposals for yourself, but from a cycling point of view, they are disjointed, full of gaps and have critical fails which will not enable anyone who wants to cycle. Protection ends at the large junctions, people cycling have to share bus lanes with multiple bus routes and they are not even 4.5m wide (which is still awful for cycling), so the brave people cycling will hold up buses. There are also advanced stop lines which have no place in modern layouts and quite a few of the right turns will be difficult (below). One section between Stoke Newington Church Street and Brook Road will have a south-bound bus lane with a northbound general traffic lane. 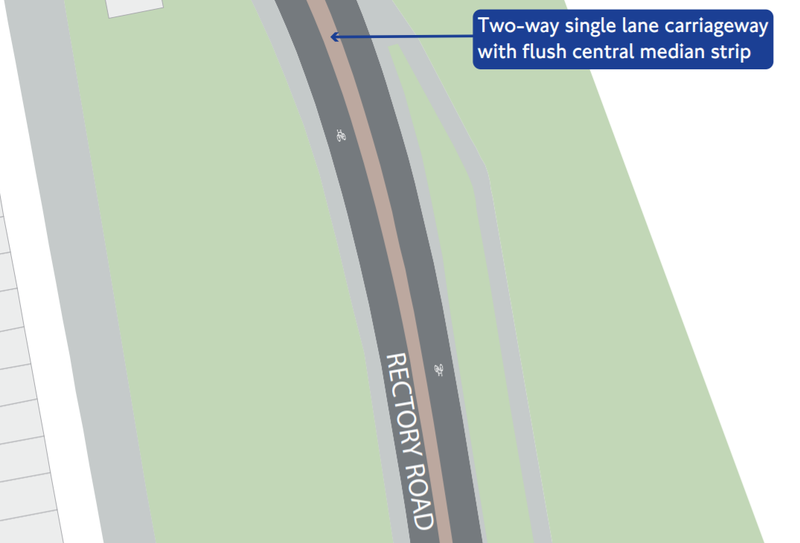 A northbound cycle track has been proposed for part of the route and it's good to see floating bus stops; but in several places, the cycle track will have part time loading taking place on it which operates 7am to 10am daily. It's nuts because it won't be available for commutes and the school run. 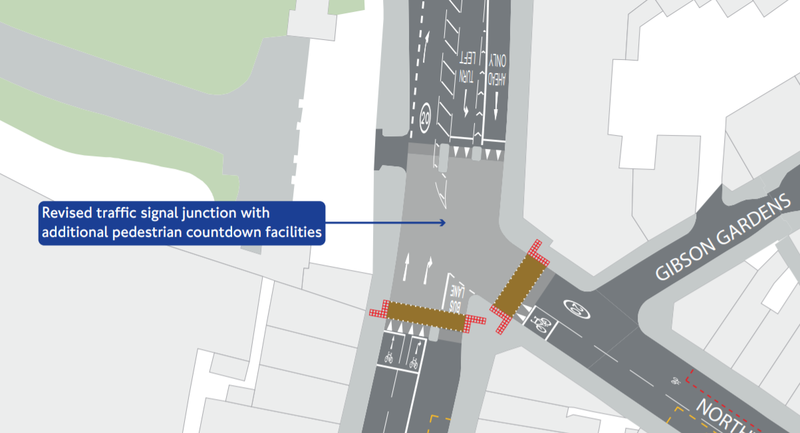 Part of the gyratory away from the High Street (Rectory Road), will have an overrunable central median and people cycling having to take primary position in the traffic (below). This will be carrying general traffic southbound largely on the current route via Northwold Road, Rectory Road and Manse Road and so in reality, it's only a partial removal of the gyratory and cycling here is going to be hell. For people walking, some continuous footways are proposed which is welcomed and they come with drivers only being allowed to exit side streets on a left turn (below) which is a good, low-conflict layout. There are also some crossing improvements. For the wider area, there are some modal filters being proposed and space released for 'pocket parks' (above). Although the consultation doesn't say, I assume that there will be various bits of resurfacing and other ancillary works required due to the gyratory removal. There are lots of little details which make this scheme terrible for cycling, but it's pointless me going through each one because the project as a whole is such a critical fail for cycling. While I think walking fares better than now, it's probably more to do with removing the gyratory than concentrating on desire lines. For bus passengers, a more direct route through the High Street for some bus routes has got to be a significant improvement, but as I mentioned above, people cycling are going to cause delays or they will end up getting close-passed by bus drivers. So, what would I do? In some ways, it doesn't matter because I cannot possibly second guess the information which is at hand and I've not been party to any of the discussions which got us here; but I will offer some views in a minute. First, I wonder how the design got here. The road we are talking about is designated as the A10. In comment with so many other parts of the UK, the designation came from an evolution of the high street as a place of commerce, but over the years, they have been subsumed into a corridor for long-distance traffic. London does of course need to be serviced and in terms of serving the inner part of the city, the A road radials mean that lots of traffic will be passing through many neighbourhoods. In other words, the local importance of local high streets is in direct conflict with the demand for through traffic. London also has a pretty dense network of buses and so the A road corridors have become important for bus travel and as a result, we have installed bus lanes and so this can in some cases mean there is no chance of fitting in cycling properly - it does vary with location of course, but where there are space constraints, the bus lanes tend to service the morning peak direction. In many cases, the bus lanes give up at junctions anyway and so when being used by people cycling, left hooks become more likely as drivers pull to the nearside. The Stoke Newington proposals are essentially for bus and general traffic with walking and cycling fitting around those two other modes. Cycling has been provided where it doesn't interfere with bus lanes and walking gets space from what is left over as a result of partially removing the gyratory for general traffic. If the scheme objectives were set out in the context of the Mayor's healthy streets agenda, his promise to make cycling a byword for London and having 80% of Londoners walking, cycling and using public transport, then the scheme would be completely different. 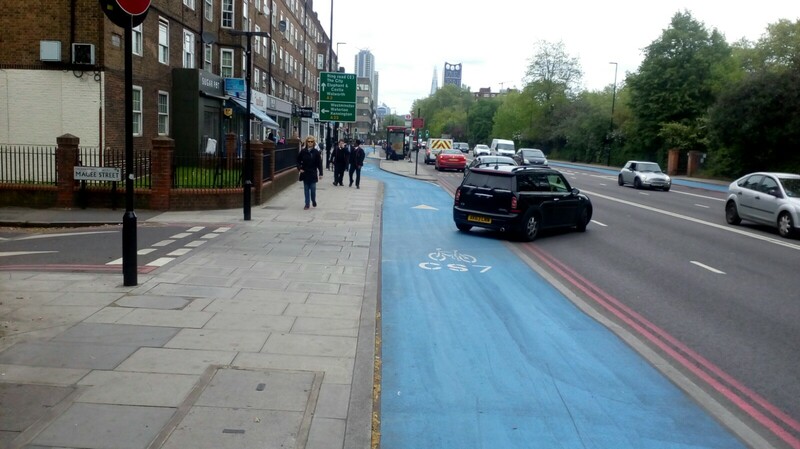 Unless we built continuous and protected cycling infrastructure on main roads, ever detail which is watered down into painted lanes, bus lanes and space for turning traffic at junctions will simply scare people off from taking up cycling for transport. 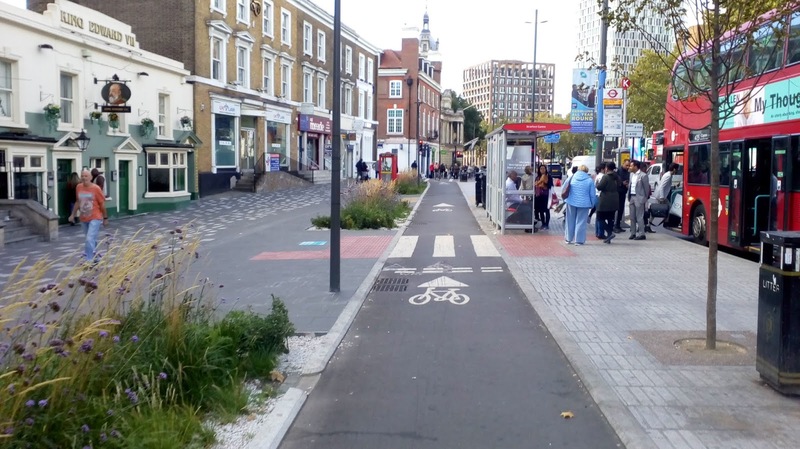 Cycle tracks which connect to filtered side streets also help to build a network for cycling - especially for local people wanting to use the high street shops and services. The filtered side streets with crossing close by also help to enable local trips to be made by foot - especially if it means people not bothering to get into their cars because their journey would be far longer! So, my approach to the scheme would be to set out cycle tracks along the length of the scheme. Next, I would be looking at what side streets I would filter which means a bit more of a network review. Once we have an idea, then we align pedestrian crossings as close to the filters as we can get - you come out of the end of the street, you can cross on the desire line and then decide to go left or right. Next, we look at buses. There is a wider issue about the tangle of bus routes in London which in many cases literally go round the houses into streets where we probably shouldn't really be sending them. It's controversial, but corridors such as the A10 would be better served with routes which only stop at key points (such as Stoke Newington) and in some cases, people will need to use feeder routes to get to main routes. We also have the huge cost differential with train services which means many people are using the buses for very long journeys because it is so much cheaper than catching the quicker train. TfL should be looking at this more in my view. For places like Stoke Newington, the bus lane aligned to peak hours seems like quite a good idea (southbound in this case), but it is utterly impossible to achieve with a decent level of provision for cycling and with the proposal, the northbound cycle track will have loading on top of it. As you can see from the image above, the street has three traffic lanes at the moment and the proposal is for a cycle track (with morning loading on it), a northbound traffic lane and a southbound bus lane. This section between Brooke Road and Stoke Newington Church Street is a huge challenge - to the north and south, there is more carriageway to play with. There is a compelling argument here that the removal of the gyratory works against this section of the high street and so I think we have to build the cycle tracks. There would only be enough space left for one traffic lane and so this would have to be cleverly managed - the space actually cries out to be pedestrianised, but this works against the desire to improve bus access. Perhaps we can take a cue from Orford Road in Waltham Forest. We would permit two-way buses at all times with loading being from one direction during selected off-peak times. We don't have cycle tracks which does mean mixing with buses and some deliveries, but good design and enforcement of the controls reinforces people priority. It might require (shock horror) for a bit of alternate working and bus drivers having to negotiate with each other - think of a single track road with passing places! Yes, it's radical, but the current proposals cannot work for cycling and without radicalism, we'll just lock in a mess for another 20 years. If we go radical then we have more of a chance to reduce motor traffic which in turn enables us to be even more radical. In terms of servicing, it's not really going to be done from HGVs and there are very few going through the area (so other large will be used to serve Central London). Yes, there are plenty of LGVs, but the elephant in the room as usual is the amount of car-based traffic. This means that unless these volumes are tackled, then we will never be able to provide a transformative scheme. My personal view is that those interesting in rebalancing streets for people should not be supporting the scheme or at least, be non-committal. I fear that those wanting to build properly for cycling will immediately be criticised as anti-bus (passengers) and walking, but without the cycle as a mode for short to medium distance trips, we cannot possibly emulate the experience in other parts of the world where cycling is a proper part of the mix and designed for accordingly. In the final analysis, the scheme cannot possibly deliver the Mayor's vision unless there is a real desire to tackle motor traffic. The consultation for the scheme ends on 30th November. Would it be possible instead to just close the high street as a whole and pedestrianize it ? The Waltham Forest Mini-Holland cycle schemes are a bit of a mixed bag. 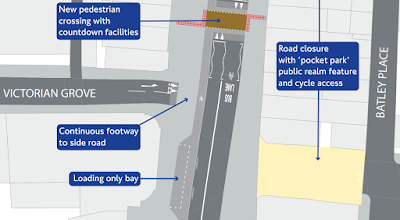 unfortunately the provision for cyclists on main roads (such as Markhouse Road and Blackhorse Road) seems to have been at the expense of pedestrians who now have very narrow footway widths that are inadequate for the number and composition of pedestrians. As a result pedestrians are 'forced' into the cycle lanes to pass oncoming pedestrians. I have witnessed cyclists then swerving off the stepped track onto the carriageway to avoid colliding with the pedestrian. On a more general note, I think that in the UK the insistence on not losing parking bays has led to compromises when it comes to making provision for walking and cycling. I am a frequent visitor to Brugge and Ghent in Belgium which are both towns where large numbers of people cycle. Unlike towns and cities in this country there seems to be more willingness to sacrifice parking. On main roads leading into the city centres the absence of parking bays allows cycle lanes to be provided and on the narrow one-way streets in the central areas parking is allowed only on one side (if at all) allowing for two-way cycling.